Moussaka is an eastern Mediterranean and Middle Eastern dish that consists of sauteed eggplant, tomato and ground beef, arranged in layers somewhat like lasagna. Because it has ground beef and eggplant cooked in oil, moussaka tends to be calorie-dense and high in fat, so it's not an optimal choice for dieting. Different recipes have different nutritional values, and you can make a healthier version if you alter the ingredients. Moussaka is a calorie-dense food, as 1 cup of prepared moussaka provides 550 calories. This amount comprises more than 27 percent of the daily recommended intake of 2,000 calories. Eating moussaka isn't ideal for dieting, as it would take about 57 minutes to burn off the calories in 1 cup of this food. Moussaka is calorie-dense because it is high in fat. Each 1 cup serving of moussaka provides 40 g of fat. According to the American Heart Association, you should limit your daily fat intake to between 50 g and 70 g, so 1 cup of moussaka provides between 57 and 80 percent of your total daily fat intake. Moussaka is also a rich source of carbohydrates, as it provides 30 g. This amount is 3 g more than a 1/2 cup serving of oatmeal provides. Carbohydrates are beneficial for athletes and other active individuals, as they are your body's primary source of fuel. 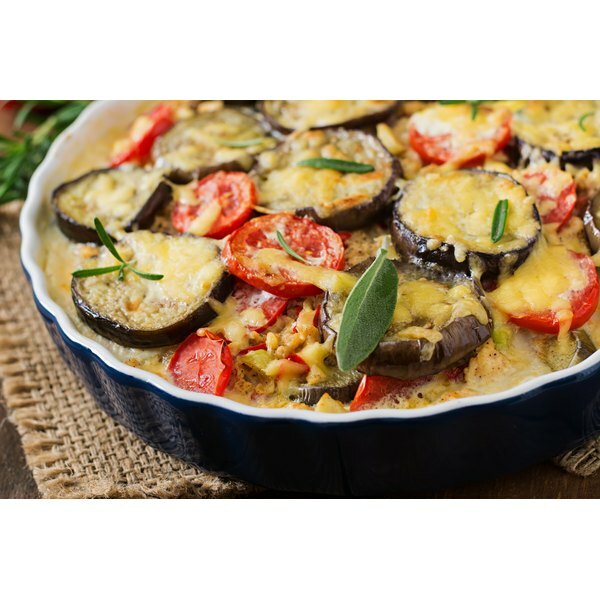 A serving of moussaka provides 5 g of dietary fiber, a nutrient essential for proper health. Dietary fiber may help you manage your cholesterol and blood sugar levels, keep your digestive system healthy and the nutrient also promotes regular bowel movements and feelings of fullness. Ground beef is rich in protein, so moussaka is a high-protein dish. A serving of this dish provides 25 g of protein, more than four times the amount in an egg. Protein builds and repairs your body's tissues, so it's important to consume protein daily.